With nearly 5,000 acres either under development or complete, Lake Las Vegas has long been a world-class development. 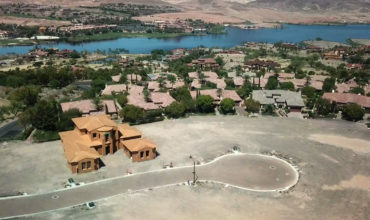 The Great Recession took its toll on everything, and Lake Las Vegas was no exception. However, the past few years have seen a Renaissance at this one-of-a-kind community. As developers, we briefly let our minds contemplate the opportunity of resurrecting one of the most valuable projects in the western United States. We then went to work forming a design and development team that could create and execute what this resurrection would look like. It had to be a comprehensive plan that included community and lifestyle as well as a strategic design and build process of world-class estate residences. It was imperative that our group afford this project the justice it so deserved. After all, Lake Las Vegas was at one time a Residential Master-Plan of international significance. It arguably still holds that esteemed moniker by those who understand its history and value. Lake Las Vegas has been carving Old World opulence out of the harsh Mojave Desert for nearly 30 years. The original crown jewel of the community has always been the exclusive, state-of-the-art enclave known as the South Shore. Along with being home to the first Jack Nicklaus Championship Golf Course in Southern Nevada, the amenities, landscaping, residences and technology found on the South Shore has been unrivaled anywhere in the Desert Southwest and beyond. Carmenérè by Level Development Group is in fact, the last precious jewel to be set within that crown. We began by sending our Level Development staff on a company sponsored trip to San Diego. Our mission there was an extensive tour of the Rancho Santa Fe Region of San Diego County, an area that offers much in magnificent and authentic California Mission Architecture. This municipality and market continues to hold an elite position as of one of the most exclusive zip codes in North America. It was there we were inspired, but also challenged. Yes, we found what we were looking for, however the projects that we most related to as a building group were priced at an average of around $17 Million! That exceeds our target home market in Las Vegas by about sevenfold, at least at this juncture in our maturation process. We gathered and absorbed everything we could get our hands on in this amazing community and historical region then returned with a renewed excitement of our own vision: The continued resurrection of the Lake Las Vegas South Shore, and within it our new project Carmenérè. We began to formulate a hyper-refined motif, combining all that we had learned in Southern California with the 30-year distinguished heritage of the South Shore. We wanted to pay homage to all the existing projects that had not only come before us, but were still revered by residents, investors and newcomers to the community. Our goal consisted of a three-pronged approach: 1) To incorporate all the new & modern aspects found in cutting edge housing products, not only in current use, but future products as well. 2) Utilize the best accents, elements & aspects found in the plethora of modern techniques and incorporate those popular methods with the pure authenticity found in California Mission or Rancho Santa Fe Architectural Elements. 3) Compliment the brilliantly planned and established South Shore in its current state. In crystal clear terms, we wanted to intertwine ultra-current elements of design, technology and materials to create what we felt was the best of “Old & New”. It is a combination of classic and cutting that gives our clients the opportunity to live amongst the very best of the past and the future. Carmenérè offers the epitome of Ancient Origins. Yet is powered and accented with the latest in industry advancements. I have tended to fall out of favor with the term Transitional. Because it is an incomplete term. It is open-ended and nothing can stay transitional forever. Instead we have sought to find something that was “complete” and that felt finished and perfected.